It’s easy to focus on the major needs when talking about survival. Food, water, fire and a few other things get a lot of airtime, when it comes to discussing what we need. But the reality is, there are a lot of minor things that are necessary as well. Having enough clean water to drink and food to eat won’t matter for much, if you and I end up dying of disease. That’s why we need soap. Yes, something as simple as soap is actually important to our survival. It’s one of the biggest and best defenses we have against disease. Soap not only helps us to clean dirt and germs off of our hands, but it is a fairly good antibacterial as well. But what do you do when there’s no soap to be found? One option is to use the root of the yucca plant. Yucca grows throughout the Midwest and Southwest, from Texas up to Alberta, Canada, although it is found mostly in warmer climates. This amazing plant is useful for a lot of things, with the roots being edible. The root of the plant is a tuber, like a potato; with the liquid pressed out of it is also usable as soap and shampoo. Yucca are fairly easy to dig up, as the tuber is the only real root of any size. The rest of the roots are hair size and break easily. But the tuber itself can go quite deep, especially on a large plant like the one shown above. If you’re going to dig up a yucca, I’d recommend using a smaller plant, like the one I’m digging up below. Before going any farther, I need to mention that it is not legal to dig up yucca in all places. I was able to dig this plant up, because it was on private property and the owner wanted to get rid of it. The plant shown in this photo was found in the wild and would have been illegal for me to harvest. So before you do this, make sure you’re doing it someplace where it is legal; unless, of course, you’re in a survival situation. As I’m doing this for survival purposes, I decided to try digging it up with a machete, rather than a shovel, under the assumption that I might not have a full-sized shovel available to me. I wouldn’t want to try and dig up a yucca with the small folding shovel I have in my bug out bag, because the ends of the leaves are all thorns. Digging it up with that small a shovel would probably see my hands scratched up pretty badly. Related: This Super Root Preserves Meat Indefinitely! As you can see in the photo, I’m holding the leaves aside, while I dig with my machete. What I did was insert my arm under the leaves, and then lift it up, pushing the stiff leaves up with my arm. I was then able to turn my hand around and grasp them, getting them out of my way. Once the leaves are out of the way, it’s a simple matter to stab the machete into the ground, all around the root. I made a circle about eight inches in diameter, which was enough. Then, grasping the plant’s stalk, near the root, I simply wiggled it back and forth, breaking the root free and was able to lift the plant out of the ground. The leaves of the yucca can be used for other things, like making some pretty good sandals; but for now, all we need is the root, so I cut it off at ground level, with one swipe of my machete. Once cleaned, the root looks like this. As you can see in the picture above, the root is covered by a thick skin or husk. We’re going to need to cut that off, much like cutting the outside off of a pineapple. It is hard, but not all that difficult to cut. In order to make it easier, I cut the root in half, allowing me to put the flat, cut end on my cutting board. The skin of the root cuts off fairly easy, if you have a good, sharp knife. I had no problem, but I’m using a very high quality knife with a really sharp edge. Notice the red around the edges of the pieces in the foreground. This all needs to be cut off, as well as the dark lines you can see in the piece I’m cutting. 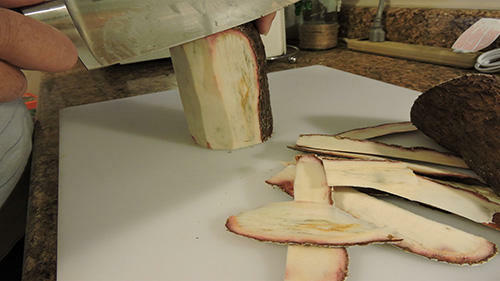 The peeled root is then sliced and diced. I did about ½” cubes. You can do smaller, but I wouldn’t recommend any larger. 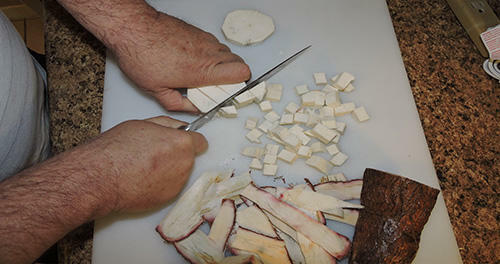 The ½” cubes worked well for my needs.These cubes of yucca root then need to be broken down. Even though I’m working in my kitchen at this point, I didn’t use a food processor or blender for this. We’re doing this for survival soap and I doubt that any of us keep a food processor in our bug out bags or survival kits. We need something that’s more on the order of what we’d use in such a situation. 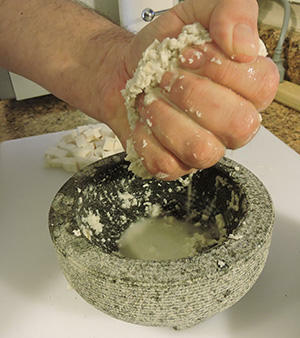 I used a Mexican molcajete, which is a traditional mortar and pestile. Rather than being made out of ceramic, they are usually made out of lava rock, which is very porous. Mine is made out of granite, which isn’t as porous, making it grind less, but is much easier to clean. Traditionally, the Mexicans use these for making salsa and guacamole.The root is hard enough that I found it necessary to beat it with the pestile, breaking it down, before grinding it. You want to get it as fine as you can, ending up with a fibrous mush. Actually, the finer you grind it, the more usable soap you’ll get out of it. 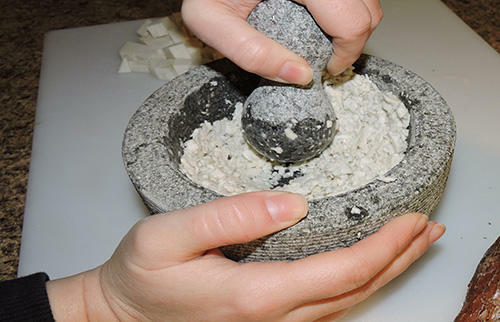 The molcajete isn’t the only way you can grind up the yucca root for use. The same thing can be done with the type of grinding stone that the Indians used for grinding corn. However, I don’t happen to have one of those and it would have been expensive to buy. In the wild, I would look for a flat stone I could use to grind on, with a rounded rock out of a river or stream as my pestile. With the root thoroughly ground, you’re ready to extract the soap. All that’s needed it to take the ground root in your hands and squeeze it. The liquid that comes out is usable as soap or shampoo. If you need to really scrub something, such as a greasy pan, you can use the ground up root as soap. In this case, the fiber in the root will act as a scouring pad, helping you to clean the surface. But you’ll need to use a fair amount of pressure with it, so as to press the soap out of the fiber as you go. Even after we’ve gotten a lot of liquid out of the ground root, it is still useful for cleaning. We can dry the root in the sun and save it. Then, when we need more soap, we can reconstitute it with water, which will draw more of the chemicals we need out of the ground up root, giving us more soap. It is best, when doing this, to not have pressed out all of the liquid from the ground root, as you will get better soap from it the next time around, if there is still some liquid in it when it is dried. Interesting post. Makes me want to add to my soap and shampoo stores so I can avoid this task as long as possible. There is one thing in the post that I take issue with, and that’s using a machete to dig up the root. Why risk damaging a good tool? Machetes are made for cutting. Shovels are made for digging. That’s what I’m doing lately, Hoosier H. Every time I go to Walmart I pick up six packages or so of my favourite soap. I have quite a store of soap on hand. Probably enough for the rest of my life. Yucca really doesn’t do that well where I live. Especially in a winter where we’re regularly having -30’s C and -40’s C. I COULD grow it inside but I don’t want it inside. Also have quite a bit of dishwashing liquid on hand. In a pinch I’m sure you could use dishwashing liquid for your hare. Dishwashing liquid is formulated to be kind to your skin and cut grease so shouldn’t bother your scalp that much and clean your hair at the same time. Speaking of hair, as goofy as it sounds, and to “cut” (ha ha) down on parasites that might get into our hair if we’re forced to be in close proximity such as an underground shelter for an extended period of time, why not just shave our heads? Both men and women alike. Would that not cut down on the probability of us getting scalp-related diseases, ticks, etc. in an extended SHTF situation? And then we wouldn’t need shampoo. Women are also beautiful without hair. Beautiful bald women turn me on. 🙂 Isn’t that the first thing they do with new armed forces recruits. Shave their heads? And isn’t that the main reason why they do that? To cut down on all the scalp and hair related diseases that could occur when people are in close proximity for extended periods of time? You want to come into my shelter, either shave your head or take your chances outside. And for those thinking that a shaved head is too cold in our winters there are always hats, hoods and toques. I’d rather be a little uncomfortable instead of having an infestation of fleas, ticks or whatever in a small, enclosed shelter. Armin, I have Capt. Picard’s hair line. Just body wash for me. …I don’t know if my wife would cut off her hair or not; probably in a BAD situation, she would. She has had long hair since here teens. That would be a big step. …Hope it never comes to that! I totally agree. I never use my machete to dig up anything. I keep my machete sharp, and use it only for cutting. Worse case scenario, use hands. Do you grow soaproot in your yard? We have it all over the brush out back. The seed pods when young can be cleaned and stuffed, then cooked. The whole plant has a use. Flower stalks can get up to 12 feet long, and make good bean poles. Soap can decay, but the plant can last for years in the ground. Seems like a really ton of amount of energy to use for that small amount of soap. Does it keep for a long time? I’m thinking this should be used for emergency only. Is there any way to make more, like adding water or something? Can the left over root (after squeezing) be used for anything? Or eaten? When we lived in the Canal Zone our buffets at the Officers Club always had Yucca balls in a white sauce along with Iguana and other good stuff. It is typically yuca (with one “c”) that you find in restaurants. 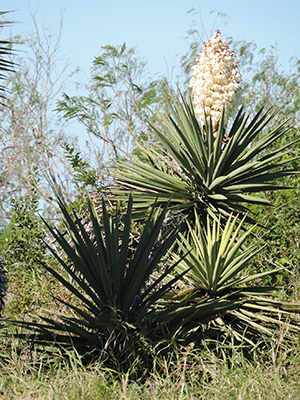 Yucca is a different plant, but both are indeed edible. 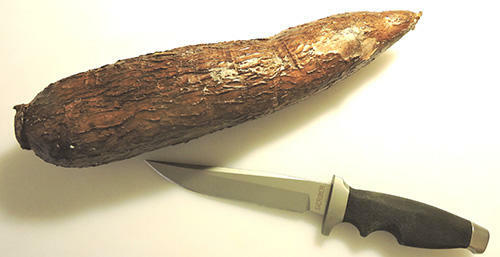 If eating the stalk or the root of the yucca plant, it needs particular care in its preparation, to remove the saponins (the chemicals useful as soap), but most of the plant is edible. we just boil before eating or making noodles. Tastes like chestnuts. 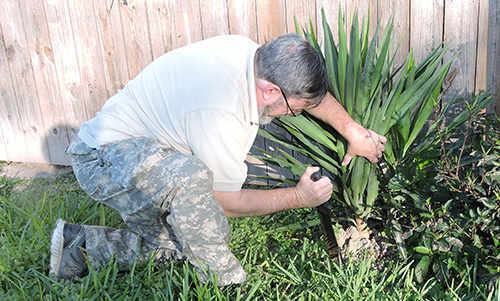 If I were fooling around with a yucca plant, I would wear a long sleeved shirt and gloves. In addition to a needle-like thorn at the end of the leaf, the edges of the leaves are as sharp as knives and can cut you quite easily. It doesn’t matter how careful one is, it just takes a split second for the edge of a leaf to drag across your skin to give you a nice cut. In an EOTW situation, cuts are to be avoided like the plague which will also rear its ugly head. Speaking of plague, big news in SoCal, because of the rats and mice in downtown LA, because of all the bums camping out in downtown, city hall which has refused to do anything significant about the problem except to get a tax passed to build housing for the “homeless,” has been overrun with rodents. As a result, at least one deputy city attorney has come down with typhus from the fleas the rats/mice bring with them. She refuses to return to work until the problem is addressed. It appears that all the carpeting in all the splendid offices will have to be ripped out. Ha! Poetic justice. They won’t do anything about it. They are too liberally social justice this land is your land this land is my land from California to the New York islands stupid. Thank you, for doing what you do. Yucca is very rare, here, so,out here, in California, and up through southern Oregon, we use Soap Root, when were out, camping, sometimes. Here’s a link to a Wiki page, about it. Gee, I don’t know where Wolf lives, but yucca is hardly rare here in SoCal. There is even a town called Yucca Valley for some strange reason. I believe one can dig it on national forrest land and BLM land after obtaining a permission slip from our masters. Could be wrong about that but some plant harvesting is allowed on national forest and BLM land. If you live in Oregon than you can grow yucca. There are varieties I saw in Pennsaltucky, Georgia, S. Carolina, and so on, not just in the desert. You can get varieties of prickly pear as well that like moisture more than our delightful (cough) local thorns 🙂 I have to get more potato yucca (eating stuff). that’s used for soap, too. Just crush the raw peelings and scrub off. Smells sweet and heals skin problems from acne to zits and anything else. I have found the best way to dig these up, even with a shovel, is to tie the leaves up with something. That way you don’t get poked with the sharp needle on the end of the leaf. Sorry I’m a bit new to this. What in the yucca juice makes it good for soap and shampoo? like wolf, i have no yucca here, or soap root. as has been mentioned, yucca soap seems like a lot of work for a little product. soap, on the other hand, is pretty easy–not the “soap base” you purchase and add scent and color. i mean fat plus lye. i use rendered lard plus a little coconut oil if i have it and pure granular lye. if i didn’t have lye, i would save hardwood ash in a bucket and when full, make a hole in the bucket near the bottom and then pour water into the bucket. the lye water exits the hole and goes into another container. to tell if the lye is strong enough, put an egg in the lye water. if it floats, it is strong enough. if it sinks, pour the lye water back thru the bucket of ashes. repeat. Good information. But, what state do you live in without yucca? I was stuck in Penna for years (Zone 4 and 5) and people planted it in their flower gardens.Countryside Small Stock mag has a free download on making all kinds of soap, like milk soap, herbals and so on. Soap Making guide. In the event of SHFT, herbals would be good, like pine tar and so on. Pine tar soap will chase bugs, as well. Because you can replant yucca and it’ll root. Soap yucca can grow yards tall. the wind knocks it over and it forms a new plant at the base, and the top roots down. I never made a batch of lye soap that we could cook up in the house. 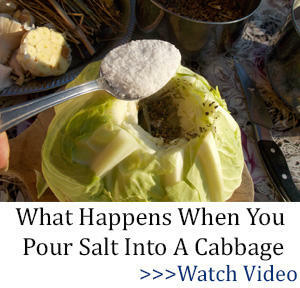 It was always done outside because the smell of fresh lye can make you sick. So, no more lye soap, but buy the stuff and will use yucca when we lose the stores.